February 2016 47 remarkable for its heavy pedestrian use, brightly colored furniture, bold paver choice and sculptural elements. By night, it's a sparkling oasis with custom light effects that attract casual users and create a memorable landmark. 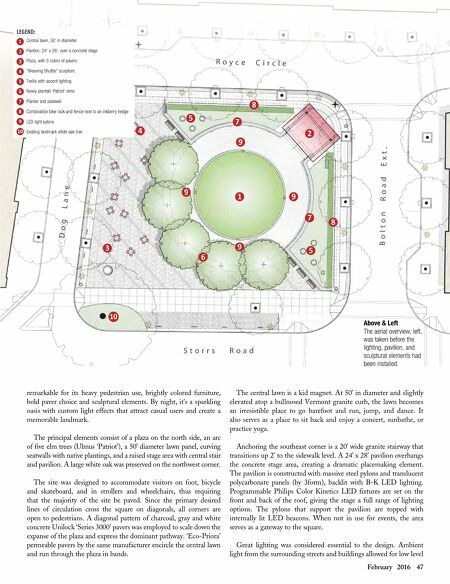 The principal elements consist of a plaza on the north side, an arc of five elm trees (Ulmus 'Patriot'), a 50' diameter lawn panel, curving seatwalls with native plantings, and a raised stage area with central stair and pavilion. A large white oak was preserved on the northwest corner. The site was designed to accommodate visitors on foot, bicycle and skateboard, and in strollers and wheelchairs, thus requiring that the majority of the site be paved. Since the primary desired lines of circulation cross the square on diagonals, all corners are open to pedestrians. 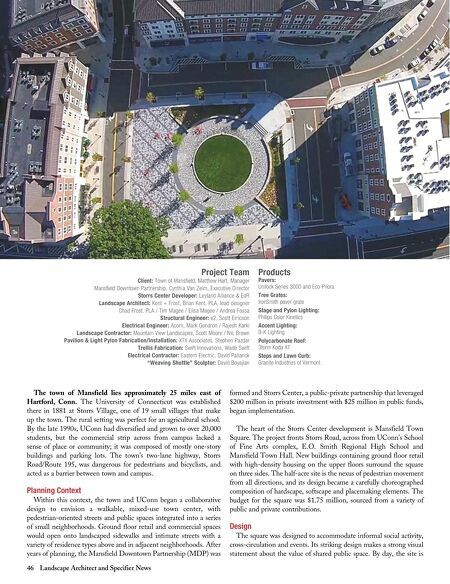 A diagonal pattern of charcoal, gray and white concrete Unilock 'Series 3000' pavers was employed to scale down the expanse of the plaza and express the dominant pathway. 'Eco-Priora' permeable pavers by the same manufacturer encircle the central lawn and run through the plaza in bands. The central lawn is a kid magnet. At 50' in diameter and slightly elevated atop a bullnosed Vermont granite curb, the lawn becomes an irresistible place to go barefoot and run, jump, and dance. It also serves as a place to sit back and enjoy a concert, sunbathe, or practice yoga. Anchoring the southeast corner is a 20' wide granite stairway that transitions up 2' to the sidewalk level. A 24' x 28' pavilion overhangs the concrete stage area, creating a dramatic placemaking element. The pavilion is constructed with massive steel pylons and translucent polycarbonate panels (by 3form), backlit with B-K LED lighting. Programmable Philips Color Kinetics LED fixtures are set on the front and back of the roof, giving the stage a full range of lighting options. The pylons that support the pavilion are topped with internally lit LED beacons. When not in use for events, the area serves as a gateway to the square. Great lighting was considered essential to the design. Ambient light from the surrounding streets and buildings allowed for low level Central lawn, 50' in diameter Pavilion, 24' x 28', over a concrete stage Plaza, with 3 colors of pavers "Weaving Shuttle" sculpture Trellis with accent lighting Newly planted 'Patriot' elms Planter and seatwall Combination bike rack and fence next to an inkberry hedge LED light pylons Existing landmark white oak tree Above & Left The aerial overview, left, was taken before the lighting, pavilion, and sculptural elements had been installed.